SEWOR Precise 17 Jewelry mechanical hand-wind movement. Unique skeleton dial with Roman numerals. Steampunk style.Skeleton dial. Unique & Fashion Design,Classic Analog Style.Silver Mesh Band. Best Accessories for Casual Clothing,Business clothing. 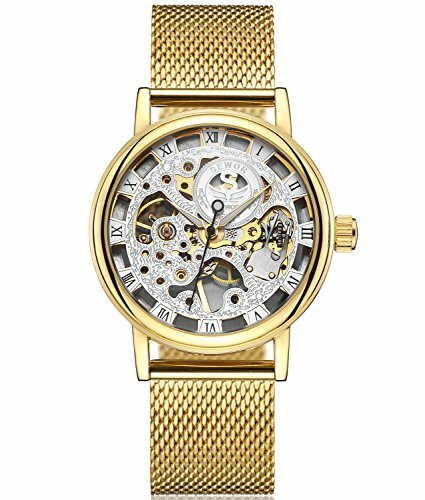 These Gentlemen Mechanical Wristwatch \"SEWOR\" is A Good Choice for Birthday, Christmas, Wedding or Best Friend\'s Gift. A package includes: 1x Watch , 1x SEWOR Giftbox ,1x SEWOR Hanging tablets.Dimensions: Diameter-40 mm, thickness: 8 mm. Note: Mechanical hand-wound watch must be wound manually, if the watch for a long time has not been worn. We encourage you to raise your watch daily. If you have any question, please contact us. Thank you!